This is the most recent book in the Tortall super-series by Tamora Pierce. Starring Arram Draper (aka Numair Salmalin), this shows Numair’s influential early days in the Carthaki Empire when he was first learning magic and gaining friends among the Carthaki elite. If I were to quickly describe this book, I would say this is Pierce’s first book which really, truly has a male target audience. I’ve read all her series before, including the Alanna, Diane, Trickster, Cooper, Protector, Circle of Magic, Circle Reforged and Circle Opens serieses. This series is the first one which really gets close to what it’s like growing up as a boy. I wish I had this book years ago. This is a Middle Grade/YA book. Arram starts the book at 11 years old, and this book takes place during his first few years in magic school. I liked the description of his classes. Plot: This book was a bit plot-light. 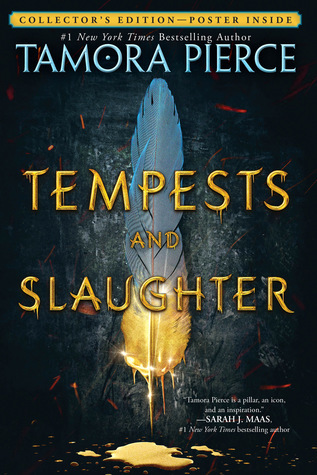 A quintessential first book in the series, this ‘Tempests and Slaughter’ contains a lot of set-up and not much pay off. There are a lot of fascinating events- namely Arram learning to heal people. I liked the descriptions of him curing typhoid patients and mending slave-gladiators after battle. It was all very well written. However there wasn’t much of a unifying plot connecting page 1 to page Fin. There was a minor conspiracy plot, but it doesn’t hold much water. This book was very much so set up for future books. Characters: Arram and Ozorne are both teenage boys. Arram in particular is passing through that awkward ‘girls are amazing’ phase. I found it to be very realistic. Pacing: The pacing was steady throughout, but you have to find the book’s premise of ‘boy goes to magic school and is awesome at it’ to be interesting. If you don’t, then you’ll find the pacing to be bored. I liked the premise, so I liked the deliberate pacing. Final Thoughts: On it’s own, this book was a fun read but the ending kinda went flat. I am HIGHLY looking forward to future books because the author did a good job setting them up. While I would probably die on a battlefield for Tamora Pierce, I’ll have to admit that I did skip this book (I know what’ll happen to him in the end, I didn’t much see the point in learning about his earlier life story). Your reviews convinced me I should read it – it just has too many of the bits and pieces I love to skip. Interesting you described it as a book for boys (I believe you emphasised this point?) considering the author’s previous books. I’ll have to check it out. Great review, and lovely to find someone with a similar taste in books! I certainly did like it! It was a book for boys in the sense that Alanna was a book for girls- a story which encouraged boys to excell in a non-traditional gender role while still going through some teenage sexual stuff. In this case Aram was going to school and doing great, instead of ‘playing dumb’ and fitting in with the rest of the guys his age.